He hit up two different record stores on Thursday. 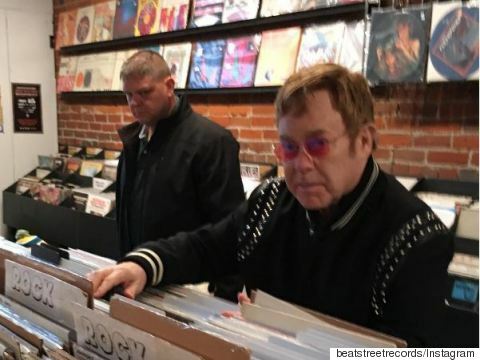 VANCOUVER — The owner of a small, independent record shop in downtown Vancouver is crossing his fingers for a repeat visit after music legend Elton John popped into his store unexpectedly earlier this week. David Jones, who has run Vinyl Records for 18 years, said he was thrilled to host the renowned composer Thursday afternoon and was impressed by the breadth of the performer's musical taste. "He came off a little bit like a musicologist,'' Jones said in an interview. "Given that that's my thing too, I think we bonded a little bit,'' he added, laughing. Vinyl Records was the second shop where the pop star flipped though vinyl. Postmedia reports he was also spotted in Beat Street Records earlier in the day, where he asked about some surprising tunes. "The first thing he asked for was something by Tech N9ne, who is like a gangsta rapper. That kind of surprised us and threw us off," Beat Street manager Lindsay Tomchyshen told the newspaper. Beat Street Records posted this photo to Instagram (@beatstreetrecords) of Elton John browsing for vinyl. Back at Vinyl Records, Jones said he was impressed with John's ability to navigate around a record store and said by the end of the 30-minute stopover his visitor had amassed an eclectic pile of records, including Kendrick Lamar and Nina Simone. In all, the shop owner said John spent about $1,400 at the store, after accounting for a discount and a few free records thrown into the deal. "People are like, 'Oh, well he's so rich, why did you bother giving him a discount?' Jones said. "But you know, even rich people like a bit of good will." John isn't the first famous face to walk through the doors of Vinyl Records. The lead singer of Aerosmith, Steven Tyler, came in randomly years ago, Jones said. John, who is English, is the recipient of numerous awards and accolades, from his induction into the Rock and Roll Hall of Fame to a star on the Hollywood Walk of Fame, and he was knighted by Queen Elizabeth II in 1998 for his charity work. His publicist said John was in Canada on Thursday but she wasn't certain where. He looked like a rock star, Jones said. "It's nice to have such a big artist who supports vinyl,'' he added.